In just a few months the search for lost distribution has taken the classical music industry from ArchivMusic to Archive Classics to Classical Archives. Despite the inexeroble rise of downloads, CDs are still an important distribution format. The page grab above is from SwapaCD, a website that offers a fascinating mix of questions and answers. For $0.49 per disc plus 1 CD 'credit' you buy CDs listed on the site by other members. It is not a new trading model, but the range of CDs on offer makes SwapaCD particularly interesting. Edmund Rubbra is a composer whose has appeared on the path many times, but his music is probably still unfamiliar to many readers. SwapaCD offers the comprehensive selection of his music seen above. A search for Jascha Horenstein's 1971 recording of Nielsen's Fifth Symphony, featured here yesterday, identifies not the Fifth but the Third available. 'Jonathan Harvey' returns a lot of interesting results, including his CD Angels which was featured here in 2007. Now for a major caveat emptor. I have not used SwapaCD, I do not endorse its service, and the copyright position on services of this type is unclear. A quick search reveals no major adverse comments about service levels. Ascertaining the legal position regarding copyright is more difficult. 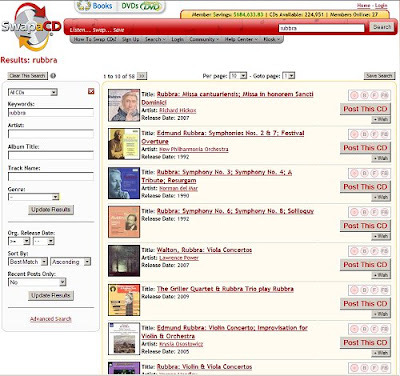 Commonsense suggests there is no difference between selling a used CD on which copyright has been paid for cash, and selling it for another CD. But then commonsense has been notably absent where music copyright is concerned. Reader's thoughts and experiences are welcome. Even if you don't use SwapaCD, searching their impressively fast database to find what CDs people are swapping is a much more illuminating way to spend a Friday afternoon than reading Twitter messages. An interesting copyright scam here.